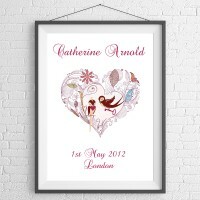 A wonderful trio of hearts filled with birds and flora is the main focus with a decorative name personalisation. if you don't want to include a name just leave the field blank. 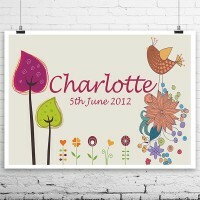 This print would make a beautiful addition to any room not just a nursery. 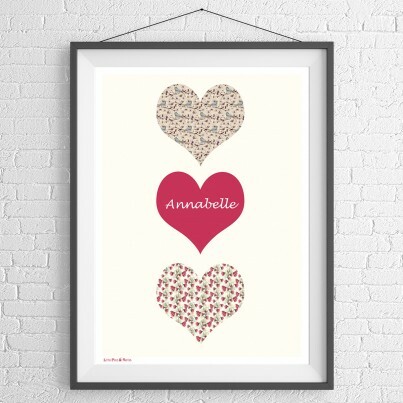 If you do not like our colours we can bespoke the print for no extra charge just contact us through 'ask the seller a question' and we will discuss your requirements. *please note the frame is for display and is not included in the price. We use only the finest materials to ensure you receive a very special print. Our Giclée prints are produced on large format professional printers all pigment editions. This printing technique offers the highest quality and most fade proof printing available. We only use genuine pigment inks that are lightfast for up to 100 years. 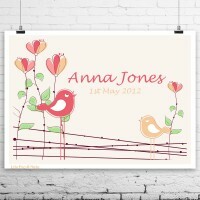 We use a variety of fine art and photo papers dependent on the design all have exceptional quality, colour and weight. Our papers are chosen to compliment the individual design. Our prints and mounted prints are beautifully wrapped in acid free toile tissue paper and tied with Little Pea and Bertie ribbon. To ensure your package gets to you safely all prints are supplied in either a card backed envelope or rolled in a postal tube. 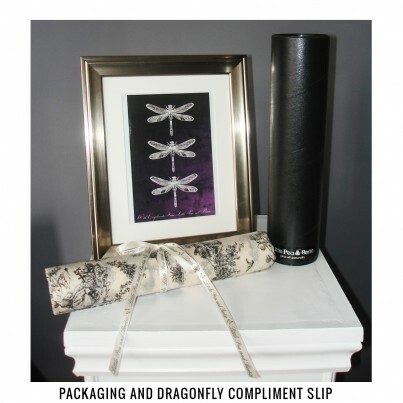 The dragonfly picture in the display frame is one of our beautiful compliment slips. Postal tubes are wrapped in bubble wrap so you are able to give the tube as a gift without delivery labels. A3 420 x 297 mm - rolled and wrapped in our bespoke packaging delivered in a tube. A4 297 x 210 mm - packaged in a clear bag with card backing and wrapped beautifully in our bespoke packaging. A3 Mounted Size 20 x 16 inch (approx 508 x 406 mm) - includes mount and mat sealed in a clear bag and wrapped in our bespoke packaging, delivered in an all board envelope. A4 Mounted Size 16 x 12 inch (approx 305 x 406 mm) - includes mount and mat sealed in a clear bag and wrapped in our bespoke packaging, delivered in an all board envelope. POSTAGE AND DELIVERY: We offer Free UK delivery Unless otherwise stated, all items are dispatched via 1st class Recorded Delivery and will require a signature on arrival. Delivery takes approximately 5-7 working days (often quicker.) If you require overseas postage, your item will be sent via Airmail and delivery will take approximately 10-14 working days. All Little Pea and Bertie artwork is made to order we therfore cannot be refunded after payment has been made. Any item which is faulty, lost or damaged in the post will be replaced. On receipt of the returned item we will print a duplicate item and have that delivered to the same address. We will not accept responsibility for any mistakes such as spelling made by the buyer but we will do everything we can to rectify any issues and ensure you are delighted with your print (this may incur additional charges). Please note that colours may vary slightly to the ones viewed on your computer due to the colour calibration.